Swimming pools are a luxury. Having a clean, healthy swimming pool is wonderful. You can enjoy relaxing nighttime dips, daytime pool parties, or just some healthy lap swimming. But as with most luxuries, owning a pool comes with a pretty hefty price tag. Keeping your pool in good condition, as well as running all the equipment day to day, can add up. For the most part, you can’t avoid spending money on your pool. But if you plan well, put in a little work, and spend your money strategically, you can reduce the cost of swimming pool maintenance. Each one of these can add up to a pretty hefty bill. So if you want to reduce the cost of swimming pool maintenance, you will have to attack each one. Luckily, there are ways to save in each of these categories. Smart pool maintenance and making the right investments can save you money in the long run. In part one, we will cover how to reduce the cost of swimming pool maintenance by controlling the costs of water and electricity. A swimming pool is, of course, a giant pool of water. But that water doesn’t just stay put. Over time, you can lose water to leaks, evaporation, and different types of maintenance. Replacing that water costs money. And even if your pool is relatively small, you would be amazed at how much water it takes to refill it. Adding just one inch of water to a standard 30’x15’ swimming pool takes 250 gallons of water. For a standard sized pool, expect to lose as much as 50,000 gallons a year, or about $100 worth of tap water. If you aren’t careful, you could lose even more water. However, if you are strategic with your maintenance and stay on top of repairs, you can save on pool water costs. The most effective way to reduce water loss is to purchase a solar pool cover. A solar pool cover is surprisingly cheap, and it’s pretty easy to lay over your pool. Just put it on at night and take it off in the day. The solar cover will significantly reduce evaporation from heat and wind. Another tip to saving money on water is to limit how much you backwash your filters. If your filter pressure gauge is reading 8-10 psi above its ideal clean pressure, you need to backwash your filter. If it’s not, then skip the backwash. If your water seems hazy, but your pressure gauge is in the normal range, look for other problems first. You can learn more about cloudy water here. If you use a cartridge filter, you never have to backwash it. All you have to do is clean the cartridge from time to time, and your filter will work just fine. In addition to reducing backwashing, try to avoid draining the pool unless you really have to. Refilling an entire pool can get very expensive. If you must drain the pool—like to fix a leak—drain it partially and then refill it. Finally, don’t let your pool lose water to leaks. Diagnosing a leak can be tough, but the best thing you can do is to prevent leaks before they occur. Check your skimmers and other openings regularly for signs of cracks or gaps. Also, check around the seam where your coping meets the pool wall. Weather and changing temperatures can cause some separating, so make sure to keep those expansion joints sealed. You can seal the joints yourself with little urethane or silicone from a caulking gun. Do it before the leaks appear as regular seasonal maintenance. Besides water, the main utility bill that swimming pools affect is your electricity bill. Depending on the type of pool equipment you have, a swimming pool can consume lots of electricity. The two main contributors to your electric bill are your heater and your pump. We’ll talk about your heater in Part Two of this discussion. 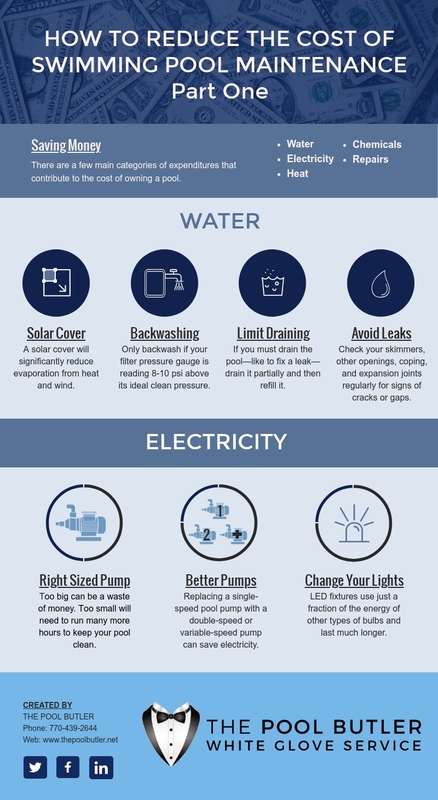 A swimming pool pump can consume a lot of electricity. For most pools, you need to run the pump 8-10 hours a day. Running a motor for that long gets expensive. But there are definitely ways to save. First of all, make sure that your pump is sized to your pool. A small pool doesn’t need a monster pump. You always want your pump to be slightly larger than the minimum requirement so that you can be sure to get proper filtration. But going too big can be a waste of money. On the flip side, if your pump is too small for your pool, you will need to run it for many more hours to keep your pool clean. Having a properly-sized pump for your pool will optimize the amount of energy consumed and the amount of time you need to run the pump. Another option for saving electricity is to get a two-speed or variable speed pump. A two-speed pump has a full-speed and a half-speed option. By running the pump at half speed 24 hours a day, you can actually use less electricity than running the pump at full speed 10 hours a day. Full speed can be saved for extraordinary situations where you need extra filtration. A variable-speed pump gives you even more control. You can find the optimal speed for your pump and keep it at that level, minimizing your electricity use. Other ways to save electricity include using more efficient lighting in your pool. Underwater lighting is a great feature for your pool but keeping the lights on can get costly. Consider replacing your pool lights with LED fixtures. LED fixtures use just a fraction of the energy of other types of bulbs and last much longer, saving you money on electricity and replacement. Sometimes you have to invest a little to save a lot. That’s true of pool maintenance, too. Maintaining your pool’s water, structure, and equipment is much cheaper than repairing it when it fails. If your water isn’t properly balanced, you could be damaging your pool. Unbalanced pool water can cause corrosion, calcium scaling, and staining. All of those issues can be expensive to repair. But they are easy to prevent. If you let calcium scaling build up on a concrete pool, you could end up with no other solution than a full acid wash. It’s normal to acid wash a concrete pool about once a decade, but poor water balancing can make it more frequent. Acid washing is a complex, dangerous process that requires completely draining your pool and hours of professional labor. The cost can be anywhere from $200 to $800 or more. High or low pH can damage a vinyl pool liner or the metal components of any type of pool. If they are too damaged, they will need to be replaced, at a significant cost. If you let damage to your pool go unchecked, it can cause leaks or other more severe damage. As Benjamin Franklin said, “An ounce of prevention is worth a pound of cure.” Don’t let problems fester until they get much more expensive to repair. Regular pool maintenance and inspections by The Pool Butler can save you money, so contact us today to learn what we can do to help you reduce the cost of swimming pool maintenance.